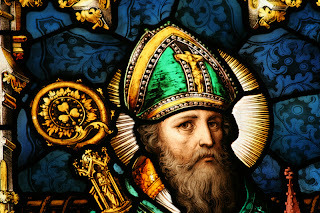 On St. Patrick’s Day I thought it would be a good idea to point out how important the work of St. Patrick proved to be to the preservation of western culture. St. Patrick was not born in Ireland. It is believed he was born and lived near the modern day border of England and Wales. He was captured at the age of sixteen by pirates and taken to Ireland in captivity. After living in Ireland for six years as a slave, Patrick escaped and returned to his native Britain. He did not stay long, however, as Patrick had a burning desire to return to Ireland and teach Christianity to the then pagan Irish. He petitioned his bishop in Britain for permission to train for the clergy and return to Ireland. Patrick had to petition his Bishop in Britain, as there was no church in Ireland. St. Patrick’s success made Ireland the first Christian nation outside the Roman world. This proved crucial to the preservation of Greco-Roman culture. Patrick’s capture by pirates was characteristic of the period that was descending upon the Roman world. During Patrick’s life, Roman soldiers abandoned Britain and barbarians repeatedly sacked the city of Rome itself. When Patrick died in 461, the Roman Empire existed in name only and by the time the Roman Empire officially “fell” in 476, Europe was already in the midst of a long period of incredible chaos. Within a few decades the great Greco-Roman civilization of western Europe was essentially gone. The constant attacks and looting by marauding bands of Huns, Goths, Vandals and others resulted in the destruction of any substantial structure including libraries, schools and other places of learning. While Roman ruins would stand to this day, the true treasure of a society, its knowledge, was disappearing. The exception to this rule was largely the newly founded monastic communities of far off Ireland. There, fairly secluded from the destruction taking place throughout Europe, Irish monks painstakingly copied by hand the great works of Greece and Rome. By 563 the Irish monks had begun a great missionary movement in Scotland, then England, before turning to the continent and modern day Germany, France and Italy. The work of these missionaries included the task of reintroducing much of the knowledge of the classical world to Europe. Without the work of St. Patrick, Ireland, and therefore the Irish monks, would never have been exposed to the great works of antiquity and many of these works would have been lost forever. We have to get John Mulligan trained on the BBT software.